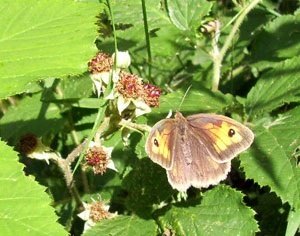 The bramble is a common native species. It is found in many different types of plant communities from woodlands, to heaths and dunes though it is not found in native pine woodland, and is generally more common in lowland than upland woods. The bramble forms an underground, perennial rootstock that throws up new shoots in the Spring. These are have a two-year ‘life span’, i.e. they are biennial. In the first year, growth is vigorous and vegetative. If the tip of the shoot comes in contact with the soil then it may develop roots and form a daughter plant (this is a form of vegetative reproduction and plants formed in this way will have the same genetic make up as the parent plant). The leaves on these first year shoots are compound and palmate, with 5 – 7 leaflets. In the second year, lateral shoots develop which bear the flowers. The leaves on these lateral shoots are somewhat smaller, and have 3 – 5 leaflets. The flowers form in late spring / early summer and are white or pale pink. The fruit, the blackberry, develops from these flowers. 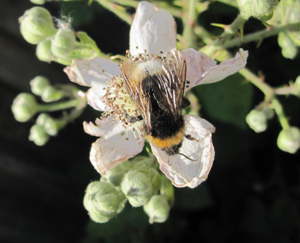 However, some brambles produce fruit and seed without fertilisation – though the transfer of pollen to the stigmas of the flowers may be required as a stimulus for fruit and seed formation. This form of reproduction (which is neither truly asexual or sexual) is known as apomixis. Brambles and dandelions both make use of this method. Some brambles are also polyploid, that is, their chromosome number has doubled or trebled. As a result of apomixis, polyploidy and crossing, many microspecies of bramble have formed . These are quite difficult to identify, relying on minute differences in the flowering and non-flowering shoots, the leaves, the prickles and young fruits. Because of these many micro-species, the bramble is considered to be an aggregate species –and is written as Rubus fruticosus agg. The fruit of the bramble is the blackberry, but in a strict botanical sense, the blackberry is not a berry. Each tiny juicy ‘blob’ on the blackberry represents a tiny fruit or drupelet, and there are many of them so it is an aggregate fruit (a drupe is a fruit that has a fleshy, outer part that surrounds a stone or seed; a drupelet is a tiny drupe). Blackberries have formed part of the human diet in Western Europe for thousands of years. Examination of ‘Haraldskaer woman’ indicated that blackberries formed part of her diet. 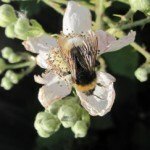 The bramble is a source of food for many species of insect and mite, with some species feeding exclusively on bramble. The bramble is also important to dormice, which eat their flowers and fruit ; they and other animals / birds seek refuge in bramble thickets. 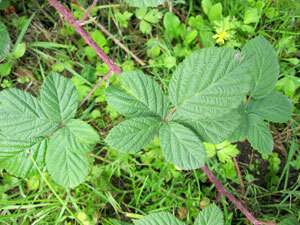 The leaves also represent a food source for deer, whose browsing may affect the development of bramble thicket. High numbers of deer can result in a reduction in the amount of bramble and consequently, the amount of wildlife in a given area. Large amounts of bramble can affect the microclimate of the ground / herb layer; influencing the growth and development of other plants. On one hand, it can offer protection from grazing / browsing to young tree seedlings but equally it can suppress the development of light loving species. i.e. The plants are long lived but individual shoots have a life span of a couple of years. I’ve had brambles in my garden for over twenty years. I read that the life span is short. could the orange variety be Stone Bramble. I too spotted these on Arran, around Brodick Castle, so wondered if it was an escaped non-native cultivated plant (like the feral fuchsias). Doesn’t explain its occurrence in Largs and Greenock not too far away on the mainland though. There is something called the salmonberry – a rubus species (R. spectabilis)that grows in the Pacific Northwest of the US which it resembles. As Stephen Ambler says, they are certainly are not cloudberries. what makes bramble grow so rapidly as light intensity increases? 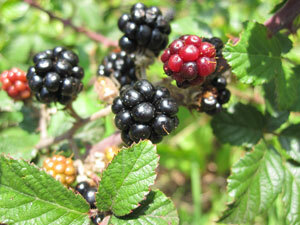 I have found a few brambles in the garden but they do not appear to bear fruit (last year or this). I have seen one or two tiny flowers. Other than to say that if the plant is well established, is there a concise guide to which varieties fruit and how to encourage fruiting. A table of varieties and their attributes would be ideal, if you know of one. difficult to know but look at http://en.wikipedia.org/wiki/Rubus_chamaemorus and see if that might be the answer ??? Found what looks like blackberrys but are orange. In largs, Scotland. Any idea? Was it just partially ripened ? This has an orange fruit. Hi’please can you help me identify a plant i found recently whilst out walking in the Greenock area of Scotland, it was a Rubus but the fruit was a destinctive orange colour it is aggregate and the leave has five parts, it was a blackberry but orange. i have brambles — blackberries i have beautiful leaves but just had a harvest of only 2 blackberry fruits. should I fertilize or not what type of soil is required. for extra blackberries I decided to grow a thornless variety, and bought a plant from http://www.gardeningexpress.co.uk, it’s done really well this year, but so have all the local hedgerows, so got them coming out of our ears! nevermind, plenty for the freezer. Perhaps if you have trouble finding them locally growing wild, you should try a plant in the garden? complete with details on how to get rid of the prickles etc ! i underst and that the bramble used to be used in weaving. unfortunately i cannot find any information on this subject.